As a communications professor and former public relations guy, it’s hard for me to look at memory studies as anything but public relations cases. After all, public memory starts as public opinion, and public opinion gets shaped in the “marketplace of ideas” where competing opinions, perspectives, and stories compete for dominance. 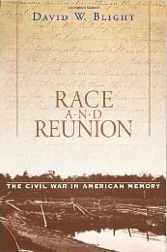 David Blight’s Race & Reunion looks at the formation of public memory in the post-Civil War years as differing versions of “what the war meant” competed with each other. Advocates for those differing versions used a variety of traditional and nontraditional forms of media in their publicity efforts to promote their stories. Blight outlines three overall visions of Civil War memory that “collided and combined over time”: the reconciliationist vision, which emphasized the shared experience of war as a tool for reunion; the white supremacist vision, which “delivered the country a segregated memory of [the war] on Southern terms”; and the emancipationist vision, which made the abolition of slavery its central tenet. “No contemporary Northerner contributed more to the war’s ideological meaning and memory than Frederick Douglass,” Blight says. But in the years after the war, Douglass’s North Star was setting, its influence waning. The cause of abolition had proved to be a great unifier, but once it was achieved, its advocates didn’t have a unified vision of what to do next and so fractured. In the South, meanwhile, blacks remained largely uneducated, and violent oppression kept them that way, essentially denying them platforms and opportunities for public discourse. In the debates over the war’s meaning, their voices were largely kept silent. Blight gives considerable attention to former Confederate Lieutenant General Jubal Early, a central figure in the rise of Lost Cause mythology, which sprang from the white supremacist narrative. “His principle aim was not only to vindicate Southern secession and glorify the Confederate soldier, but also to launch a propaganda assault on popular history and memory,” Blight says. Lost Causers created their own forms of media, controlled the agenda for what was discussed in those media, and violently attacked anyone who dared to offer a contradictory view. The Lost Cause, quickly taken up by thousands of Southern veterans, sat in direct opposition to the emancipationist vision of the war. “In reunion speeches, committee reports, and memoirs, it is remarkable to note the energy Southerners spent denying slavery’s centrality to the war,” Blight says. Bight explicitly frames those memoirs as additional ammunition in the war of words. “Early memoirists believed that they wrote in a contest with time and with their former enemies’ versions of the war,” he says. The shared experience of war allowed veterans to recognize—and later celebrate—valor and sacrifice on both sides. Such common ground proved invaluable as white Northerners and Southerners, separated by politics and war, sought for ways to live together. Blacks, without any real vehicles for keeping their agenda in the forefront of public discussion, fell into a secondary, usually forgotten, role. They were, using the terms of communication theory, not an “audience” anyone else seemed all that interested in reaching. Blight’s tone at times felt personally aggrieved by that and the lost emancipationist vision in general, and he seems to discount the need for national healing. In a sense, Blight’s text acts as a public relations tool to again forward the emancipationist vision. While it did little to directly impact public memory, Race and Reunion had game-changing impact among scholars and public historians because it significantly shifted their discussion, refocusing them on emancipation. In turn, they’ve shifted their interpretative strategies to bring emancipation to the foreground for the broader public. Race and Reunion provides a great look at competing ideas about the war and how those ideas battled it out for dominance in the intellectual and emotional marketplace. That the book has become a major modern voice in that battle demonstrates just how important Race and Reunion has been. This entry was posted in Books & Authors, Memory, Reconstruction, Slavery and tagged David Blight, Frederick Douglass, Jubal Early, Memory, Race and Reunion, Race-and-Reunion-series, Reconstruction, SHS. Bookmark the permalink.